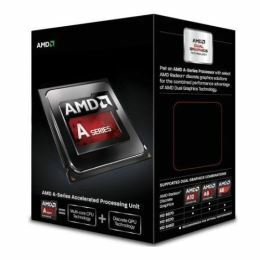 The A10-7860K 3.6 GHz Quad-Core FM2+ Processor from AMD has a base clock speed of 3.6 GHz and comes with features such as AES instructions, FMA instructions, Advanced Vector Extensions, and AMD virtualization. This processor also has a maximum turbo frequency of 4.0 GHz and features four cores in an FM2+ socket, 4MB of L2 cache, and 256KB of L1 cache. The processor's four cores allow it to run multiple programs simultaneously without slowing down the system. This processor also has two DDR3 memory channels that support memory speeds up to 2133 MHz and its TDP is 65W. Graphically, the A10-7860K 3.6 GHz Quad-Core FM2+ is powered by an integrated AMD Radeon R7 Series graphics controller that has eight cores, DirectX 12, a frequency of 757 MHz, and 512 cores. Also supported are DisplayPort and HDMI video outputs. This processor includes a near-silent thermal solution and is protected by a limited 3-year warranty.